Your guests will feel like they’re walking in a winter wonderland when they see these snowflake design place card holders on their tables. 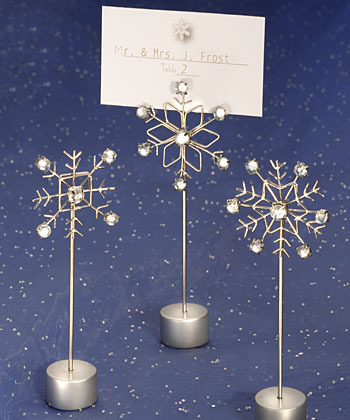 Add seasonal sparkle to your seating assignments with these charming snowflake place card holders that are also great for holding photos or notes when your guests take them home. These 12.5cm tall x 4.5cm wide place card holders come in three assorted designs, they feature a solid round base with a wire leading up to a detailed, glistening rhinestone embellished snowflake shaped holder at its top. This snowflake cardholder comes in three assorted snowflake designs. Each placecard holder comes in an individual poly-bag. These place card favours come with snow flake themed place cards included.